Rear End - 8 3/4 with 4.10 Gears. Car was a daily cruiser till we installed the stroker motor and we went racing in the no power adder King of Street Muscle Street class in 2005. We will be running next year in the new Pro Max Fastest Street Car class which is also Muscle Street. Car ran a best of 10.81 before hurting the motor at the last race of the year in 2005. It will be out for the first race in Rockingham April 14-15, 2006 breaking new PR and hopefully no parts. 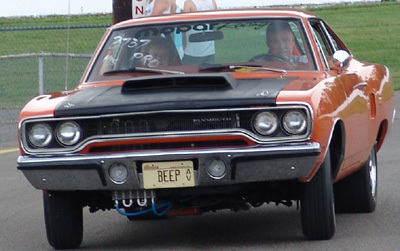 Click Here for more picture's of Jim's Cool Road Runner!